Ukulele vs. Acoustic Guitar - Which one is Easier for the Beginners? You are here: Home / Uke lovers / Ukulele vs. Acoustic Guitar – Which one is Easier for the Beginners? In fact, this answer seems to ignore the actual question – which one is easier? … in case the word “easier” means “the ability to play music in the shortest time with the least initial effort,” the ukulele will be my answer. As we all know, it will take almost as much effort and time anyway if someone wants to become proficient at any instrument. But with an ukulele, a lot of players can make music right on the first day or two. … and I strongly recommend you to take this with a grain of salt because my opinion or any other’s opinion doesn’t matter, what matters most is your preferences. Also, the differences between an ukulele and an acoustic guitar below somehow may help you get your own answer in the end. As playing these two instruments, I definitely see that both of them can bring to me a lot of fun, in different ways. While the sound of a ukulele is vibrant most of the time, the guitars’ is more flexible. Due to the atmosphere it brings, whenever I grab my ukulele, I can find it a somewhat brighter, happier instrument. Truth be told, an ukulele seems to be more successful in making pleasant and recognizable music than a guitar. However, an ukulele usually lacks of depth in sound, so for beginners some songs just don’t sound right with the ukulele. 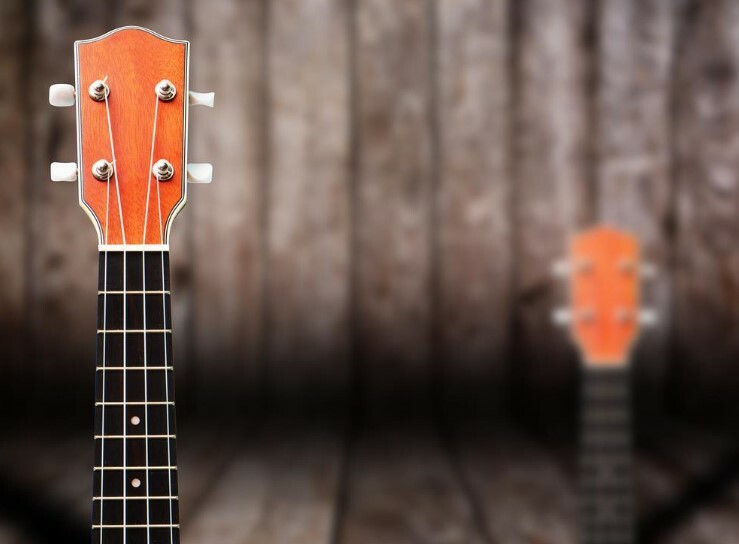 You may be wondering how the first impression relates to our topic “Ukulele vs. Acoustic Guitar – which one is easier for a beginner”. … it means you have a strong target, the process of playing will become more interesting and easier as a result. An ukulele is a four-string instrument, while a guitar is a 6-string one. Simplicity seems to be better, right? The ukulele has only 4 strings to deal with, its scale is shorter and people rarely play single note melody with a ukulele, just chords. And that means there is no need to learn how to read notes, while it seems to be not true to guitar. However, for someone who likes a large fret board and more strings to practice notes with, a guitar may be preferred. As compared to a guitar, the relatively low tension and the small fret board of a ukulele with only 4 strings definitely make it easier for a beginner to form a chord. Besides, soft nylon string instruments like ukulele is a little bit easier for you to hold the fingers down on while steel and hard nylon strings, just as the name implies, can be so hard for a starters’ fingers to press the guitar fret. There are a lot of people have to face calluses as playing the guitar, it really hurt your hands when it comes to guitar chord making. Moreover, some ukulele chords are extremely easy: all you need is one or two fingers to form a chord. “Oh ghost, that’s a piece of cake” – It’s exactly what I thought for the first time I learned to play “Someone to lava” with my ukulele. It took only few minutes for me to get acquainted with C, F and G7 chord. In contrast, those guitar chords are more complicated and F chord can even make me so scare. Another important thing you need to consider as choosing between a ukulele and a guitar is the instruments’ size. A tiny ukulele is more convenient for beginner to handle than a big guitar. The biggest size of a ukulele is still smaller than a standard guitar. It’s how funny that sometimes I feel like I’m holding a big furniture in my arms as playing the guitar. Thus, practice with an ukulele is much easier. Furthermore, due to its tiny size, you can grab your little ukulele right beside you wherever you go and whenever you want… to play, even in a small space, which you can’t do with a guitar. In other words, ukuleles are light, small and portable enough to be always available for your spare moment. It is such an easy carry musical instrument stakes that can make the practicing simpler and more convenient. Being known as a strumming rhythmic instrument, the ukulele is obviously much easier to play. Of course, people can also play ukes as a melodic lead instrument as well. Because a ukulele has only 4 strings, ukulele strumming technique is super easy while strumming with a 6-string guitar requires you to be more skillful to control the sound. In fact, I have to spend ten-time effort to train my fingers on the guitar than on the ukulele. 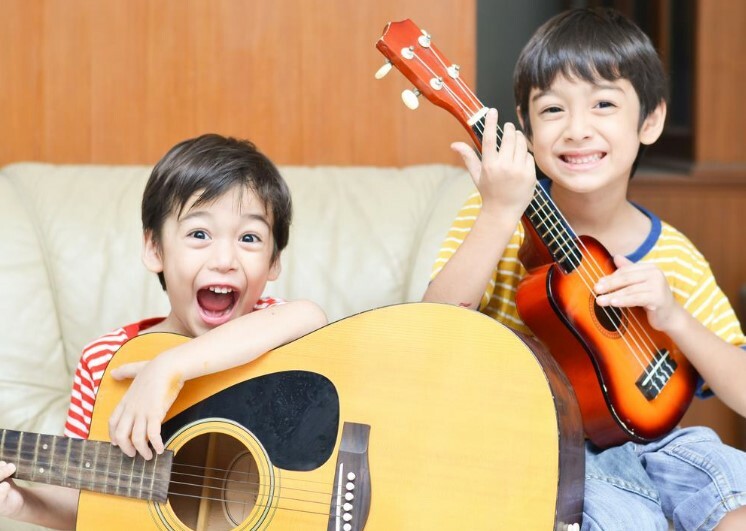 Now when you take a further look at ukulele and guitar lessons, you may find it harder to get help from ukulele masters than from the guitar masters. 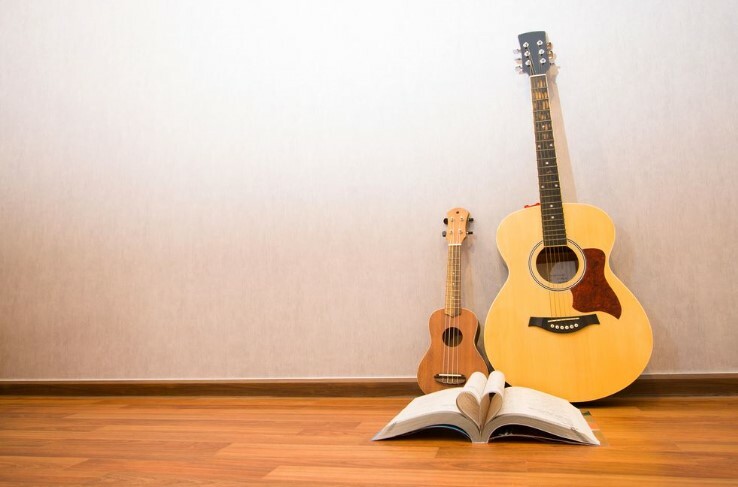 Of course, there are tons of tutorial of both ukulele and guitar out there but while we can learn from basic to advanced guitar lessons, most of the ukulele tutorials are just made at the starter level. You should consider this if you want to go far with ukulele. Another reason why learning ukulele is so simple is that we can find a lot of songs which easy to play with an ukulele. Don’t worry if you only know a few basic chords because there are thousands of songs with C, G, Am and F chords available for beginners. Especially, simple songs with only 3-4 easy chords are the motivation for beginners when they learn how to play a new instrument. It goes without saying that a ukulele is easier for a beginner than a guitar. Whatever you want as finding the answer for this question, let me tell you that don’t care much about what I or anyone think. Just let yourself give both guitar and ukulele a check and get your own decision. In case you want to take up the ukulele because it is easier for beginner, make sure you love it. My own experience is picking the one that will inspire you to practice more, then enjoy your own choice. Hopefully, this article can help you choose a suitable instrument for you.